Longspan Work Benches are perfect for any workshop, warehouse or office.They come in three depths, six lengths....all really strong. Need something to handle a tonne of weight...then you need the Pallet Racking Work Bench.Choices of three lengths and two depths. 1Select your work bench type. Longspan or pallet racking. 2Choose work bench length to suit your space. 5Add an undershelf from the options column. This long span workbench comes with two (2) uprights (900 by 600) with safety caps, four (4) 1500mm beams and one (1) sheet of 18mm particle board to suit. This workbench has a total capacity of 2000kg. This longspan workbench comes with two (2) uprights (900 by 600) with safety caps, four (4) 1200mm beams and one (1) sheet of 18mm particle board. This workbench has a total capacity of 800kg. This long span workbench comes with two (2) uprights (900 by 600) with safety caps, four (4) 2400mm beams and one (1) sheet of 18mm particle board to suit. This workbench has a total capacity of 327kg. This long span workbench comes with two (2) uprights (900 by 800) with safety caps, four (4) 1200mm beams and one (1) sheet of 18mm particle board to suit. This workbench has a total capacity of 793kg. This long span workbench comes with two (2) uprights (900 by 800) with safety caps, four (4) 1500mm beams and one (1) sheet of 18mm particle board to suit. This workbench has a total capacity of 635kg. 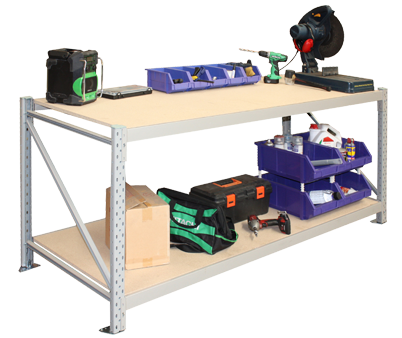 This long span workbench comes with two (2) uprights (900 by 800) with safety caps, four (4) 2000mm beams and one (1) sheet of 18mm particle board to suit. This workbench has a total capacity of 471kg. This long span workbench comes with two (2) uprights (900 by 400) with safety caps, four (4) 1200mm beams and one (1) sheet of 18mm particle board to suit. This workbench has a total capacity of 793kg. This long span workbench comes with two (2) uprights (900 by 400) with safety caps, four (4) 1500mm beams and one (1) sheet of 18mm particle board to suit. This workbench has a total capacity of 635kg. This long span workbench comes with two (2) uprights (900 by 400) with safety caps, four (4) 2000mm beams and one (1) sheet of 18mm particle board to suit. This workbench has a total capacity of 471kg. This long span workbench comes with two (2) uprights (900 by 400) with safety caps, four (4) 1800mm beams and one (1) sheet of 18mm particle board to suit. This workbench has a total capacity of 529kg. This long span workbench comes with two (2) uprights (900 by 600) with safety caps, four (4) 2000mm beams and one (1) sheet of 18mm particle board to suit. This workbench has a total capacity of 471kg. 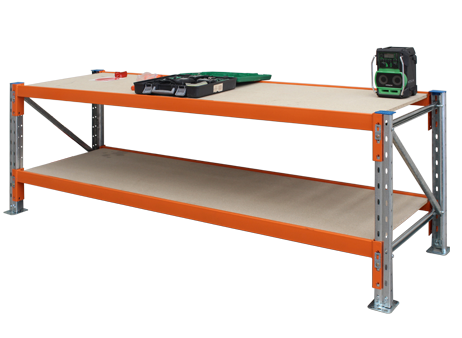 This long span workbench comes with two (2) uprights (900 by 800) with safety caps, four (4) 1800mm beams and one (1) sheet of 18mm particle board to suit. This workbench has a total capacity of 529kg. A standard work bench consists of 2 uprights, 4 beams and 1 particle board top-shelf. Add a timber undershelf for more storage. Wire undersheves are also available.Give us a call to discuss your needs. Metal shelves are perfect for wet areas and last for years.Give us a call to discuss your needs.